Baltic are Europe’s largest lifejacket manufacturer, and already carry a 5 year guarantee, but this year are offering the first service free of charge. It is very important to maintain inflatable PFDs to ensure they perform if needed. There are multiple components susceptible to failure, and some service agents are identifying high failure rates among poor quality lifejackets. Baltic is a Swedish company and proudly manufactures in Europe and is renowned for its high quality. Baltic and supplier Kiwi Yachting are taking this initiative to ensure your family’s boating is safe this summer and for many years to follow. They hope to encourage boaties to get into the habit of regularly checking their safety gear, and using quality equipment that lasts. Plus, quality also means comfort. Milan from Big Angry Fish reckons his Baltic Winner 165 is the most comfortable lifejacket he’s ever worn, and Frank Racing chose the Baltic Legend for their Coastal Classic victory this year. 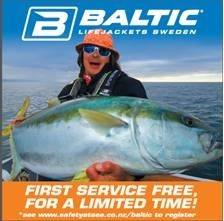 Ask your local dealer for a Baltic lifejacket now; this offer is for a limited time only.